The Greencheek Conure or Green-cheeked Parakeet (Pyrrhura molinae) is native to west-central and southern Mato Grosso, Brazil, through northern and the highlands of eastern Bolivia to northwestern Argentina. They prefer forest areas, where they form big flocks and can often be seen at treetop level. 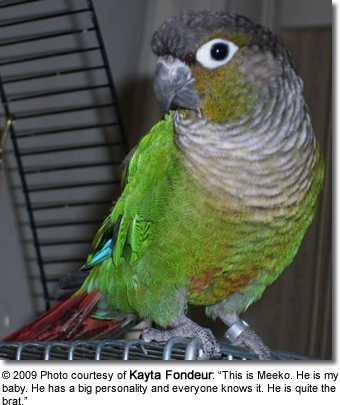 This conure is endangered in its natural habitat (CITES II). In the wild, they eat various seeds and fruits and probably other kinds of vegetable matter. 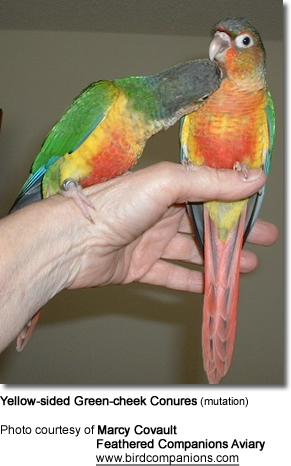 They reach maturity at 1 to 3 years -- the smaller Conures mature more quickly. In a safe, healthy environment, they can expect to live up to 35 to 40 years. 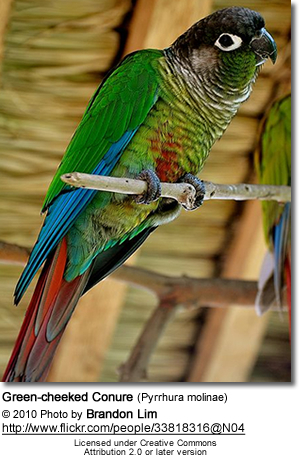 The Green-cheeked Conure is primarily green, with a grey breast, dark head, maroon tail and blue flight feathers. Its average weight is about 70 g - but the general weight range of this species is between 60 to 80 grams. The average length (including tail) is 10 - 11 inches (25 -27 cm). 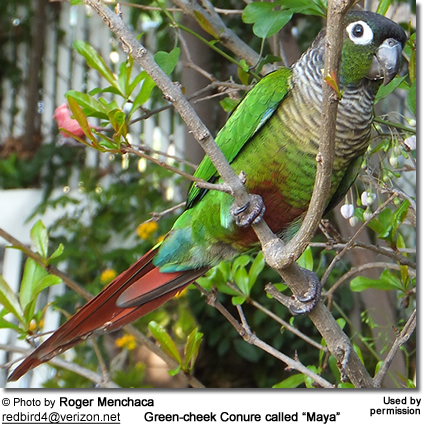 They are very similar to the Maroon-bellied Conure (Pyrrhura frontalis) - they have formerly been considered conspecific (one single species). Green-cheeks are also similar to the Blaze-winged Parakeet (Pyrrhura devillei) and the Black-capped Conure (Pyrrhura rupicola). 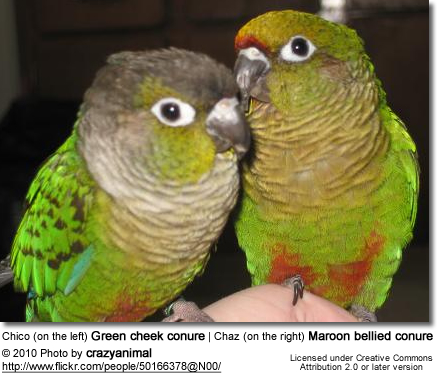 I love all Conures but am particularly fond of the Green-cheek Conures. The Green Conures have big personalities for such small birds. They have become a favorite in the pet trade because of their sweet personalities and fun disposition. They are playful, affectionate and intelligent. 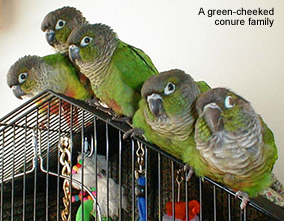 Pet green cheek photos that show the playful personality of these conures. Donnie describes his green cheek as follows: [ I] just absolutely love my "Zora". When Zora bounces her head up and down, I think that she is dancing! She is also a character - even with the two dogs. All three will run around the floor and the dogs are usually be chased by Zora. Green cheeks are not considered the best talkers. However, some particularly smart green cheeks learned to talk quite well, according to their owners. The majority of green cheeks say only a few things, and there is no guarantee that they will ever learn to talk. They also have soft and gravelly voices, so even if they try to talk, they may not say anything understandable. But there are also some green cheeks who talk a lot. If you talk to some smart greencheeks in context they often learn to speak in context (i.e. "good night" at night, "bye bye" when you leave for work in the morning, "hello" when they greet you). 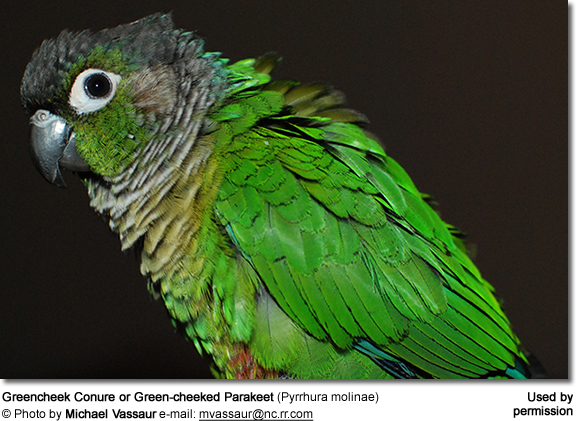 Green-cheeked Conures can be noisy (although less so than other conures). They can be prone to biting, particularly when young, but an owner can cure this behavior with patience and time. Behavioral issues can be avoided or minimized with proper handling and socialization. 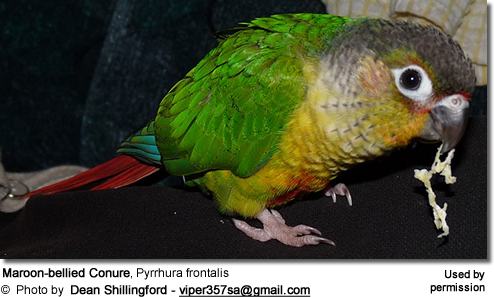 Rene Whitaker describes is Turquoise Green-cheek as follows: "[W]e got him when he was 7 months. He was hand fed, very tame. He is almost 2 now. He has a good vocabulary. He says his name Xander, daddy, stop, stop it, step up, Gary , no bite, get ova here, give me kiss, thank u,welcome, come er, and he laughs. He won't talk around other people and he knows what words get him the most attention. He is a very, very wonderful bird." 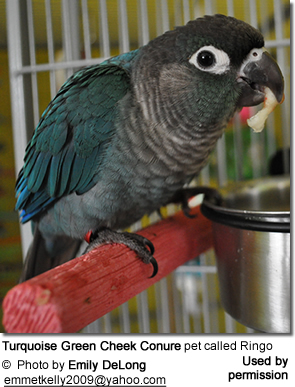 Thomas Beccaris is owned by a a green cheek conure who says phrases like, 'Can I Have A Kiss,' 'I Love You.'' She will ask for a kiss and when you make a kissing sound she makes a little "thank you" chirp. And if you ask her for a kiss, she will make the kissing sound as well. Thomas also states that this talented greencheek is learning more by the day. Another, anonymous, web visitor wrote: "My greencheek is a very talented talker, "with an extensive vocabulary and clear elocution." " ... they both can talk, not real good, but they talk. The male says 'Lokee pretty bird' and the female says her name, Sweet Pea and baby. She can also say '"mommy, daddy, and Max' . She also sings along with a song my husband made for her. It goes Sweet Pea baby bee the bird (all of which she says along in the song in the right spots along with throwing a kiss). Her favorite word is 'baby' which she can say in several different voices." 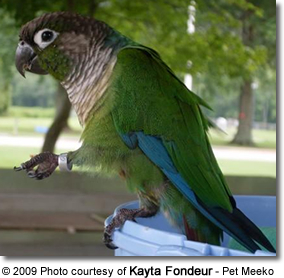 Another webvisitor, Lorraine Gordon, states: "Green Cheek Conures are great talkers." Katie wrote that her green cheek conure vocabulary consists " Its OK, Dont bite, Good morning, Whats the matter, I'll be back , Good boy" - amongst others.